It’s no fun looking out the window on the first day of spring, waiting for the snowfall to begin. So to counter the gray skies and eat something bright and sunny. 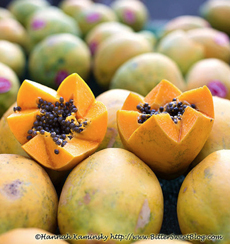 Anticipating the weather, we acquired a ripe papaya and other fruits for this recipe from Hannah Kaminsky, who is wintering in Hawaii. “At the Salted Lemon Smoothie & Juice Bar,” she writes, “they’ve perfected the art of building an unsinkable papaya boat. Local orange and pink-hued fruits, more brilliant than a sunrise in paradise, are hollowed out and stuffed to the brim with granola, yogurt, banana slices and blueberries, and finished with a light shower of chia seeds. “The contrast between creamy yogurt and crunchy cereal, flavored with the ripe and juicy fresh fruits, is so simple yet so satisfying,” she concludes. Have papaya as part of a sunny breakfast or lunch. Photo © Hanna Kaminsky. *If the fruit isn’t sweet enough. 1. DIVIDE a half cup of granola between two plates to set up a “foundation” for the papaya boat. This will help prevent it from capsizing when you eat it, and it also provides a layer of crunchy cereal to enjoy. 2. 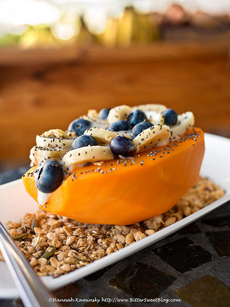 PLACE the remaining granola inside the papaya halves (1/4 cup inside of each) and top that with the yogurt, spooning equal amounts into the two boats. 3. ARRANGE the sliced banana and berries as desired. Top with a sprinkle of chia seeds. 4. FINISH with a light drizzle of syrup as desired. 1. When papaya ripens, the green skin will turn mostly yellow with patches of red. Smell the fruit at the stem end; a ripe papaya will be fragrant. 2. Squeeze the papaya gently; it will give a little if it is ripe. Avoid papayas that are overly soft. You can ripen the papaya on the counter in a brown paper bag overnight, or place it in a sunny spot for a day or two. 3. You can refrigerate a ripe papaya in a plastic bag in the fridge for up to 3 days. You can use papaya in any number of recipes, or simply eat it like a melon. Wash the outside, cut the fruit lengthwise and discard the seeds. But do the seeds have any other use? While there is no scientific evidence, in some circles the seeds have caught on as a potential health food. They are nontoxic, should you want to try them. You can eat papaya seeds whole, or can grind them up. Here’s how to do it from WikiHow, which claims that the taste is “fairly similar” to ground pepper. The skin should not be eaten. Yellow/Orange fruits: apples, apricots, cape gooseberries, cantaloupe, golden kiwi, grapefruit, lemons, mangoes, nectarines, oranges/mandarins, papapyas, peaches, pears, persimmons, pineapples, tangerines, yellow figs, yellow watermelon. Yellow/Orange vegetables: acorn/butternut/pumpkin/other squash varieties, beets, bell peppers, carrots, corn, rutabagas, sweet potatoes, summer squash, Yukon gold/other yellow potatoes, yellow tomatoes, yellow winter squash varieties. Red/pink fruits: apples, blood oranges, cherries, cranberries, grapes, grapefruit, pears, pomegranates, raspberries, red pears, strawberries, watermelon. Red/pink vegetables: beets, bell peppers, radicchio, radishes, red onions, red potatoes, rhubarb, tomatoes.